I hope you keep on sitting in your padded cell with a lot of spare time. What you do is, for me at least, most entertaining. Cool chap this Allan. Awesome! I like everything about that! @Trish: Sketchup is a nice program once you learn how it works. Plus, there's a free version, which my wallet loves. Getting models into Bryce isn't hard because Bryce imports .dae files. I did have some troubles importing my recent model because Sketchup does some funny things if operations aren't carried out properly. I found a work around by importing everything into Mesh Lab then exporting them as .obj files. I had thought of using Wings to reassemble everything, but found out when they imported into Bryce they were no longer separate objects. Also, while in Wings I found out several of my objects were not one piece but two pieces. So I combined those while there. And if you happen to wood work, Sketchup is great for drawing up detailed plans. @Sandy: Your latest scene is really looking better. @Horo: Congrats on the new products. Working outside all week in the wind and the rain blessed me with a cold for over the weekend. Delightful. Yesterday was a right off, but today I've managed to get back onto project UV mapping in Wings. If I've uploaded the wrong one, do let me know. My head is still full of cotton wool. 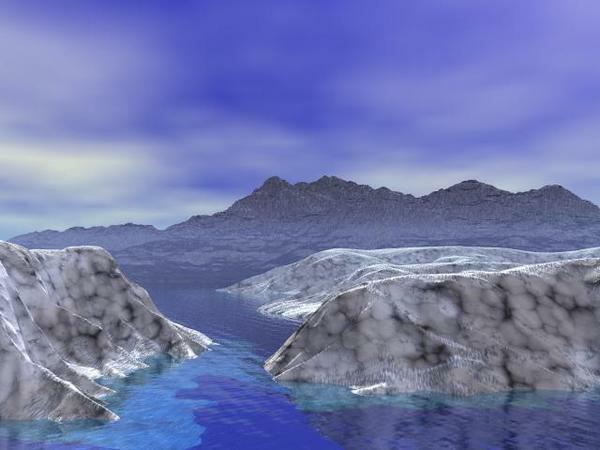 Here's my first attempt at a full terrain scene - then I tried to get fancy with IBL and the Sky Lab; lost the plot somewhere along the way and got the distance haze in the foreground and the supposed- to- be- far- away- mountains stuck out like a sore thumb! Onward and upward on the learning curve - great fun! 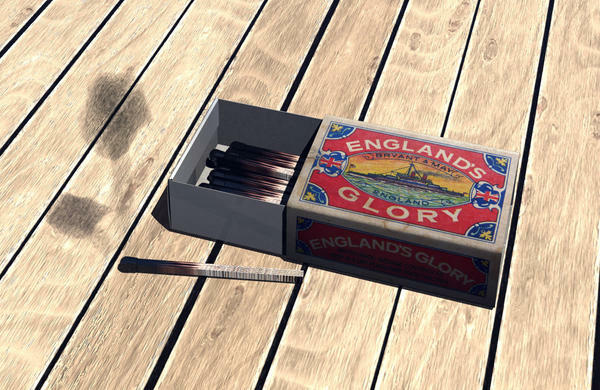 @David - nice matchbox, thanks a bundle. Get well soon. @Trish - very nice floor you've put the matchbox on. @Roygee - you're making progress. Though IBL is the easiest way to light a scene (most of the time anyway), I wouldn't start with it. Just stick with the sun for outdoor scenes until you got the hang of sky colour, haze and clouds. That'll keep you busy for a moment. 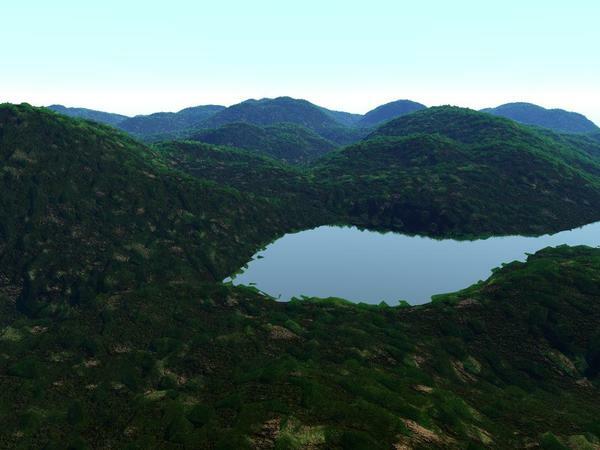 Speaking of HDRI reminds me that I've been working the last week to debug and finish my simple HDRI tone-mapping program I started last September, and write up the documentation. It only takes 3 minutes to tone-map a 450 Mpx 96-bit file to a 24-bit one. 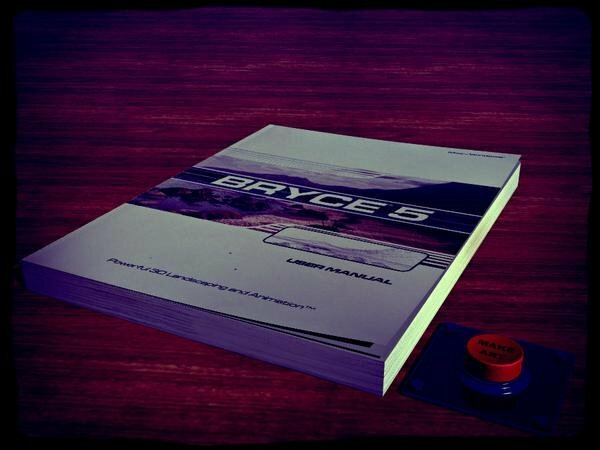 It is free and can be found on my website (see sig) under Bryce Documents > Programs > Light. @David: Thanks for the model. Hope you start feeling better soon. @Trish: That turned out well. Did you borrow or create the material for the ground plane? It looks really good. @Roygee: From the looks of that scene you are starting to get the hang of Bryce. 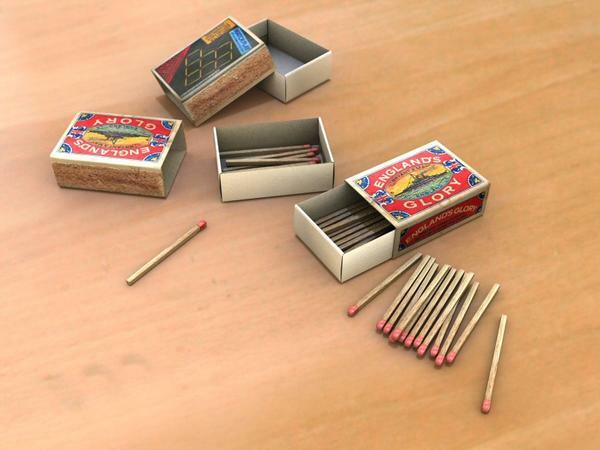 OK put the matches away now! I don't want to see any burning books! 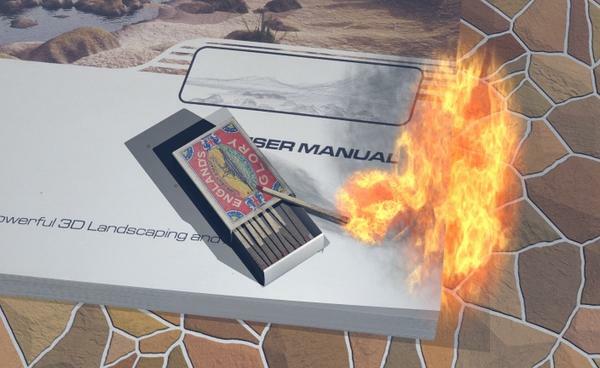 Also, the manual and the matches were made to scale. And it looks like you've made the manual bigger (or the matches smaller) although, that would still be the manual being bigge because the matches are a standard size. Which file is corrupt? I will re-save and re-upload. @Trish: Fire effect is really nice. 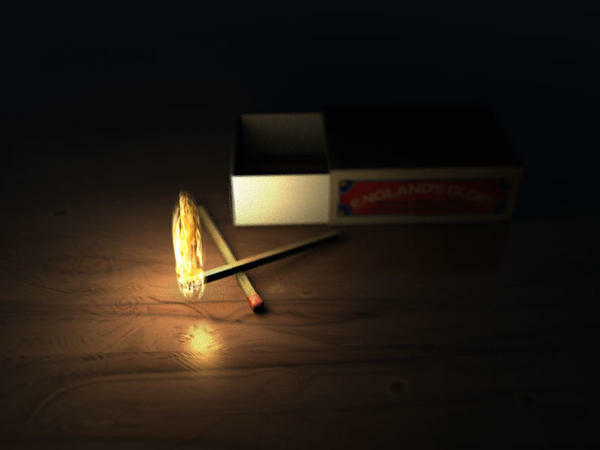 @Jay: I saw that effect once after dropping a box of matches. @David: Your models are really nice, and thank you for them. Any secrets you'd like to share? David – thanks for the models. Hope you are feeling much better. Trish, Horo, Jay – playing with matches, now isn’t that dangerous. @mermaid - Gorgeous render. I clearly need to watch that one next! Okay, here's my latest take on my scene. 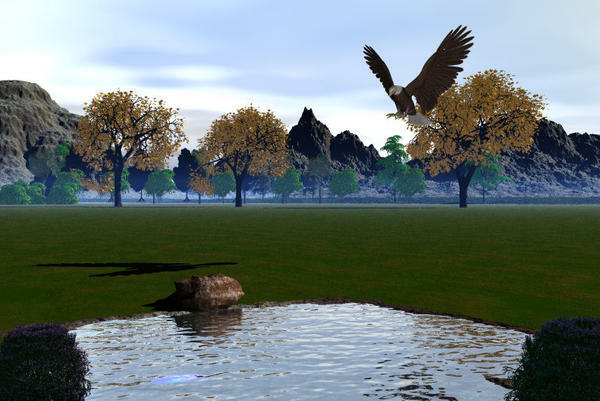 I've got to do something about the tree line, but I've added the eagle to the picture. @David - thanks for the book, mine doesn't look so nice anymore. @Trish - Nice fire effect, the subject on fire is wrong. 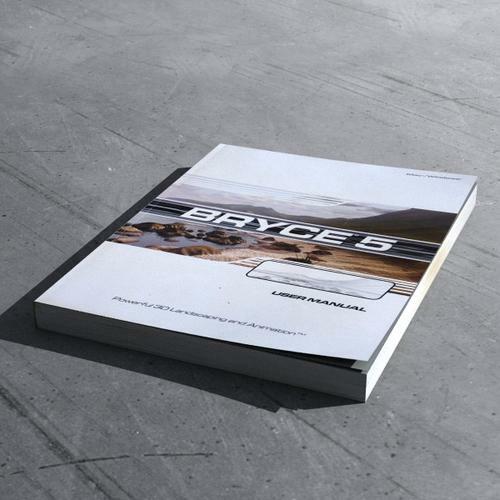 You want to use an object made in Bryce in DS or Poser (funny idea). Export as OBJ is all the advice I can give. @mermaid010 - nice landscape with rich vegetation. And you're more than welcome. Hope you find it useful. @Sandy - you do make progress. Now we have shadows. @mermaid: That place must get plenty of rain. It's sure green. Looks real nice. @Sandy: The eagle, and its shadow, is a real nice touch. The tree line looks a bit to uniform, at least to me. Perhaps scattering the trees more might help? @Pam: So that's my problem, no Make Art Button. You don't by any chance have one for straight lines do you?